The shy, innocent, deadly blue-ringed octopus. From the blue-ringed octopus’s perspective, your breathless screaming and vomiting aren’t her fault. This little lady—barely the length of a pencil, from tentacle tip to tentacle tip—was just lurking in a nice rock crevice on an Australian beach. With her mellow nature and yellowish-brown skin that matched the rocks, she was patiently waiting for a delicious crab to scuttle by. Even when you leaned over her, she tried to warn you by flashing those bright blue rings dappling her body. Then you picked her up. You were probably paying so much attention to the wiggle of her tentacles and the texture of her tiny suckers that you didn’t notice the painless nip from her parrotlike beak. Now, 10 minutes later, you notice something strange. Your lips are going numb. So is your face. You want to yell for help but can’t: It’s getting harder to speak. And your stomach feels—oh, gross! Right in front of everyone. Somebody calls an ambulance. It’s getting tough to stand. It’s getting tough to breathe. The numbness is spreading to your hands, feet, and chest. And you continue to be aware for every agonizing moment of it. You get to the hospital in time. You get hooked up to a ventilator, the machine forcing air into your lungs because your diaphragm is paralyzed. No antidote, the doctors say. You have to wait it out. About 15 long hours later, your muscles start working again. They take you off the ventilator. You can breathe. Congratulations! You survived being bitten by one of the world’s most venomous animals. But the octopus doesn’t make her own tetrodotoxin. Scientists think that she grows microbes inside her salivary glands that make it for her. But the tetrodotoxin doesn’t just stay in her saliva: It’s distributed throughout her body. When she lays her eggs, even those will be filled with tetrodotoxin to deter predators. When that frightened little octopus bites, the tetrodotoxin in her saliva quickly enters your bloodstream. With lethal biochemical precision, it blocks the tiny channels that let sodium ions enter your nerves—sodium ions that are necessary for your nerves to tell muscles like your diaphragm to move. It doesn’t take much tetrodotoxin to paralyze your diaphragm. A single 25-gram octopus—not quite the weight of one slice of bread—has enough tetrodotoxin to suffocate 10 men. 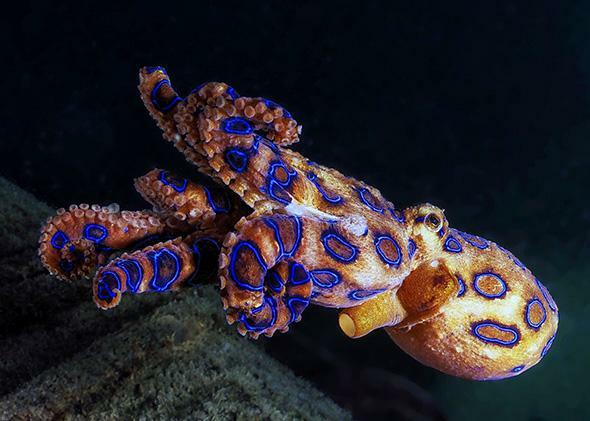 It’s a credit to the blue-ringed octopus’ docile and solitary nature—and to our emergency departments—that more people don’t die from this venom. These little octopuses spread north from Australia to Okinawa, Japan, and west from the Philippines to India. With a range like that, it’s impressive that there have been only three deaths reported, although there have been nonlethal bites and recent food poisonings in Taipei, Taiwan, linked to people eating these octopuses. But don’t villainize the blue-ringed octopus. She was just hanging out, hoping for a crab snack, when you went all Curious George on her. Of course it’s part of our nature to gawk at cool animals we find on the beach. But it’s part of her nature to defend herself. After all, she did try to warn you.